A Democratic lawmaker plans to introduce a bill soon calling for the legalization of medical cannabis in New York, reigniting the MMJ debate in a crucial market for the marijuana movement. 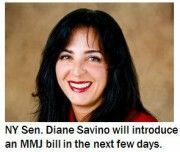 New York State Sen. Diane Savino told Medical Marijuana Business Daily that the measure is being drafted and will be ready for introduction in the next few days. She is extremely optimistic about its chances, saying that support is “growing every day” in the Senate, where previous marijuana-related measures have died. “I’m hoping the bill will be ready by the end of week, and if not then the beginning of next week,” Savino said, adding that identical measures will be introduced in the state Assembly and Senate simultaneously. The measure would set up a strict regulatory framework covering medical marijuana production and sales, using MMJ programs in states like Colorado and Connecticut as models. The industry would be subject to heavy oversight and numerous rules covering everything from security to permits and registration. The bill also would require comprehensive inventory tracking, from the time the seed is planted to the time cannabis is harvested, packaged and sold to patients. Under the bill, dispensaries could be either for-profit or nonprofit. The list of qualifying medical conditions would be very specific, including diseases and aliments such as HIV/AIDS, cancer, diabetes and multiple sclerosis. The idea is to avoid vague conditions like “chronic pain” that have inflated patient numbers and led to criticism in some other states. Patients would have to buy medical cannabis from approved dispensaries and would not be able to grow their own. It’s an important bill for the medical cannabis industry. New York is seen as an important state for medical marijuana because of its size – more than 19 million residents – and influence on the national stage. The market would be somewhat limited, with perhaps just tens of thousands of patients qualifying for MMJ cards initially because of the short list of qualifying conditions. But legalization in NY would still create hundreds of new business opportunities and give the industry even more clout, which could help convince other states weighing medical cannabis measures to follow suit. The bill could sail through the Assembly – which has passed similar measures before – and Savino said she believes there’s enough support in the Senate. If the proposal clears those hurdles, it would wind up on the desk of New York Gov. Andrew Cuomo. Getting his stamp of approval could be a challenge. Cuomo has said he is against the legalization of medical cannabis. But he has softened his position recently and agreed to explore the issue further. The governor is also pushing to decriminalize the possession of small amounts of marijuana. Savino said she is confident that supporters can convince the governor to give the bill the green light if it passes the Assembly and Senate, though she admits it will take some work. “Some people in his administration seem amendable to this, but we’d need to sit down and talk through this with the governor,” she said. Lisa Reid – a senior associate at Patricia Lynch Associates, which is lobbying lawmakers to adopt MMJ laws on behalf of a Colorado company – said the bill stands a much better chance of passing than previous measures in part because it calls for extremely tight regulations. The current legislative session ends June 20, so it’s possible New York will become the 19th state to legalize medical marijuana by summer. In anticipation of legalization, some professionals are already exploring ways to get involved. Based on the high level of interest in the market, Medical Marijuana Business Daily will hold a seminar in New York City for entrepreneurs and investors who want to learn more about the cannabis industry and opportunities in the region, including Connecticut and New Jersey (both of which have already legalized MMJ). You can find more information about the seminar or purchase tickets here. Fibromyalgia needs to be added to the list of illness that medical marijuana helps. Well Fibromyalgia wasn’t added but MS was so I able to get my license and was able to get medicine that helped for a few months but can no longer afford my medicine. I contacted Vireo Healthcare the dispensary in White Plains NY and told them of my situation. In January of 2015 I got Complex Regional Pain Syndrome/RSD, and last week was diagnosed with small fiber neuropathy a type of peripheral neuropathy. Because I have so many illnesses, I do not have a doctor because no of them no what to do. I now have loss of sensation in my feet and parts of my leg and pain is unbearable. My pain doctor left to start a hollistic practice. I was able to lower my pain medicine due to medical marijuana. Now I can’t find a doctor to raise me back to where I was. I have a progressive diseases that are getting worse and worse each day. I shared this with Vireo Heath Care and was afford a one time only 25% discount which when they charge $10,000 for what costs $280 to make to me wasn’t very kind because I am still without my Medicine. I was told I am not paying for my Medicine but for the fees NYS has charged them to start their business. So approx. 2048 patients are responsible for keeping 20 inconvenient despensaries in business. All of us with life threatening illnesses. Good job New York. We can be the prototype of how to screw up a natural plant medicine that helps dying human beings not get their medicine. Compassionate Act? Where the hell is that defined as compassion? If Gov. Cuomo ever expects to become our president He needs to start respecting the wishes of NYS residents. I pray that He will look carefully at the Medical Marijuana legislation being presented here in NYS. New York has to be on top of the list of places where someone can buy a reefer.